When should SPC be used? Many companies use SPC to control their manufacturing and assembly processes. Other companies use 100% inspection and some companies do nothing. How can one choose between these three alternatives? To make a rational choice, some questions need to be answered. What are the costs of internal and external failure on similar product? Is the product design and/or process flow new, modified or carryover? Are critical characteristics for the part and process known? Are the process capabilities known? There should be a wealth of information about internal and external failure costs that have occurred with similarly designed products and processes. For internal failures, ask how much material has been scrapped and reworked? How many people and time were involved? Quantify the facilities that needed to be dedicated to store, check, and make disposition of non-conforming parts? These need to be expressed in financial terms. For external failures, ask if warranty costs are high? Are there legal and regulatory costs? Have customer price concessions or high levels of returned parts happened? Customer perceptions of low quality can destroy a company. The records for these costs should be available and tallied, in financial terms if possible. FMEAs (Failure Mode and Effects Analysis) assist in analyzing risk. In most cases, the design and process operations are similar to a prior product and process. The risk analysis can be reduced to focusing what is new, modified or carryover. Carryover items should have known risks. New risks are associated with the new or modified elements. The new or modified design features should be added to a DFMEA (Design Failure Mode and Effects Analysis) and the obsolete features removed. Similarly, new or modified process steps that are new or modified should be updated in the PFMEA (Process FMEA), and the obsolete steps removed. A risk analysis will then show critical items that have high severity and/or high RPN. If a DFMEA and/or a PFMEA don’t exist or are incomplete, then they need to be created or updated. From the risk analysis, one should have a list of critical characteristics. The critical characteristics affect form, fit, function, durability, safety and regulatory compliance. One needs to determine if the parts will satisfy the critical characteristics. One must remember that some characteristics, while specified in an engineering layout, product specification, or contract may not be critical not critical. For example, an engine will provide dimensions and tolerances on all part geometries and surfaces. The dimensions of parts must fit within their respective design envelope, but the finish of a non-contact surface would not be critical. To control a process, it is necessary to understand the process. A process flow chart is a good tool that summarized the operations. The flow chart will assist in training new personnel and help resolve manufacturing or assembly problems. The process flow chart needs to be detailed and include operations like parallel operations, quality checks, and possible rework operations. A process engineer should be able to take a material view and trace every possible step through the process. While the equipment and layout in a plant may not change, different product may experience a different operation sequence. The process flow chart should therefore be product specific. During process development, a trial run will be conducted. The trial should use the proposed production equipment; inputs like material and power supplies; personnel; environmental conditions; processes; and run at production rates. The critical characteristics are measured, recorded, and analyzed. When measurements are collected, first step should be to determine if the data is normally distributed. If normally distributed, the simplest analysis is a calculation of the sample average, sample standard deviation, minimum and maximum data values. From this, one can determine if the measurements are contained within allowed engineering tolerances. A simple way to combine the engineering tolerances and sample statistics is to the Pp and Ppk performance indices, or the Cp and Cpk capability indices. Until the parts are manufactured or assembled during series operation, Pp and Ppk indicate the process performance. When parts are in serial production, the process is stable, and in-control, the capability indices Cp and Cpk are used. Here Pp and Cp compare variation to the tolerance limits while Ppk and Cpk are measures of process centering to target. In the automotive industry, it is recognized that not all variation factors are included in a trial run. Therefore, the target for Pp and Ppk is 1.67 or greater. During serial production the factors contributing to variation are present, so the target for Cp and Cpk is 1.33 or greater. If a process characteristic is not normally distributed, some modification to the above analysis is required. Some characteristics have high risk. For example, an airbag control module needs to function with 100% certainty. Similarly, an engine control module must be able to perform all functions to engineering requirements. In these cases, non-destructive 100% testing at the end of the manufacturing process occurs. Similarly electronics also rely on the correct placement of their parts so vision systems examine printed circuit boards on 100% of serial production. After soldering parts to printed circuit boards, a bed of nails tests checks 100% of the parts for circuit performance. Where a process is not capable of producing parts to specifications, 100% inspection is a reasonable alternative. The tire manufacturers use skilled personnel to manually assemble the components of a tire. The manual process is not capable of producing all of the tires to original equipment manufacturers (Ford, GM, FCA…) specification specifications. This does not mean the tires are unsafe, but secondary characteristics may not conform to specifications. The tires are 100% tested for quality characteristics at the end of the manufacturing line, and graded. The highest-grade tires conform to all of the original equipment manufacturers (Ford, GM, FCA…) specification. A tire that does not conform for any reason will fall into a lower grade. The next lower grade is for the tire company’s normal retail outlets. These tires are replacements for the OEM tires. The next lower grade is for tire sale. These, while safe, will probably produce rougher ride. The next lower grade is scrap, due to poor quality. During manufacturing, the tires are binned according to grade. Once the OEM tire demand is met, the OEM quality tires are diverted to the normal retail outlets. Once the normal retail outlet demand is met, the tires are diverted to the sale tire bins. The tire example presents a good case for 100% inspection when a process is not capable of meeting requirements. If a characteristic is contained within engineering tolerances, has a large Cp and Cpk index values (>2), and the process is stable, then SPC or 100% inspection may not be required. An example of this would be the dimensions of injection molded plastic parts where the tools are hard metal and the parts are soft plastic. Generally, the dimensional variations are small compared with the tolerances. The process or tooling engineers should determine if tool wear or other factors that can change the process over the long term. A caution is that while 100% inspection or SPC is not required for one characteristic, it may be required for another. Consider the injection molding temperatures of plastic parts. The temperature is a critical process characteristic. Incorrect mold temperatures may produce parts with defects that result in durability failures. During production, the tool heating will be automatically controlled, but the actual process temperatures could be subject to SPC or 100% monitoring/recording. When a process needs to be controlled and 100% inspection is not desired or feasible, then SPC is reasonable. 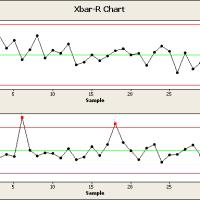 Statistical process control costs are considered failure prevention activities. It cost less than internal and external failure costs. The methods, manpower, tools, and other factors are not discussed here, but in other posts. Prevention costs will be less than paying the cost of failure. Two common prevention costs are 100% inspection and SPC. If safety and function need to be assured, then 100% inspection may be required. SPC is a less costly alternative and should be considered. If you want to engage me on this or other topics, please contact me. The first hour is so we can discuss your problem/concerns and to determine how I can help solve your analysis, design, and manufacturing problems. I have worked in Quality, Reliability, Applied Statistics, and Data Analytics over 30 years in design engineering and manufacturing. In Wayne State University, I taught at the graduate level. I also provided Minitab seminars to corporate clients, write articles, and have presented and written papers at SAE, ISSAT, and ASQ.